Don’t you just crave for authentic Japanese grub, especially the kind that won’t make you sweat your daily budget while also filling you for the rest of the afternoon? You’re in luck, then! Tracing its roots from Osaka, Japan and world-famous for its deep-fried skewers, Kushikatsu Daruma now brings you a meal set that will fit right into your lunch plans. You’ll have a bevy of donburi options to choose from: katsudon, oyakodon, gyudon; or if you prefer it grilled, there’s yakiniku and chicken teriyaki, all arriving to your table piping hot with expertly cooked meat and vegetables. Together with our Daruma Iced Tea, you also get Miso Soup to start your meal and a scoop of ice cream to cap it off, all for just P265! No frills, just gastronomic goodness at Kushikatsu Daruma. 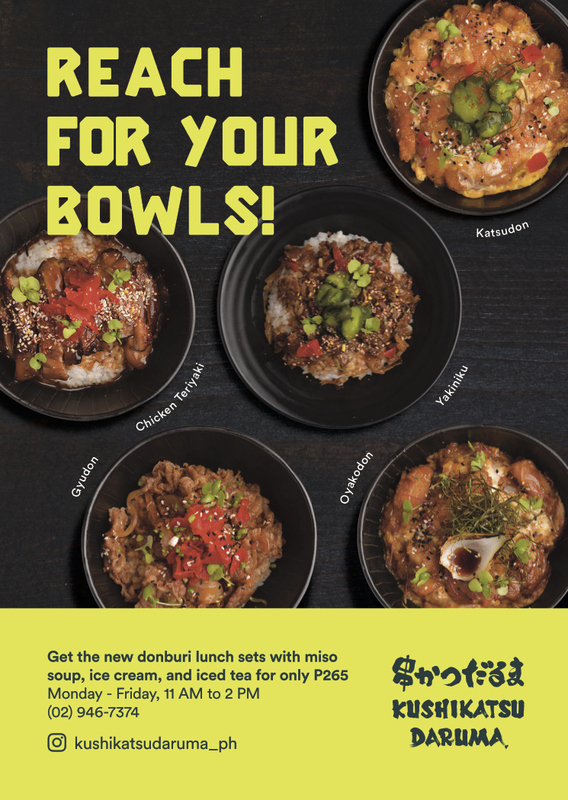 You can now try our rice bowl lunch set by heading to Kushikatsu Daruma in Uptown Place Mall (2F), 36th Street Corner 9th Ave., Bonifacio Global City, Taguig City. See Kushikatsu Daruma’s latest offerings and promos on Facebook (@kushikatsudarumaph) and Instagram (@kushikatsudaruma_ph).